Do You Know The Secret To A Masterful Creation? 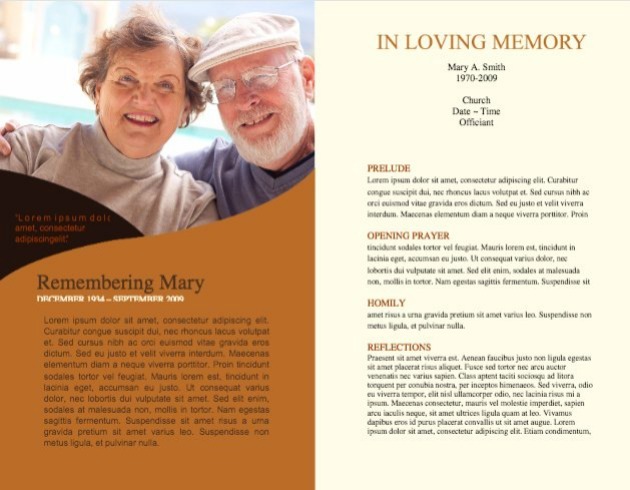 Looking for a Microsoft Word Funeral Program Template that's beyond your imagination? 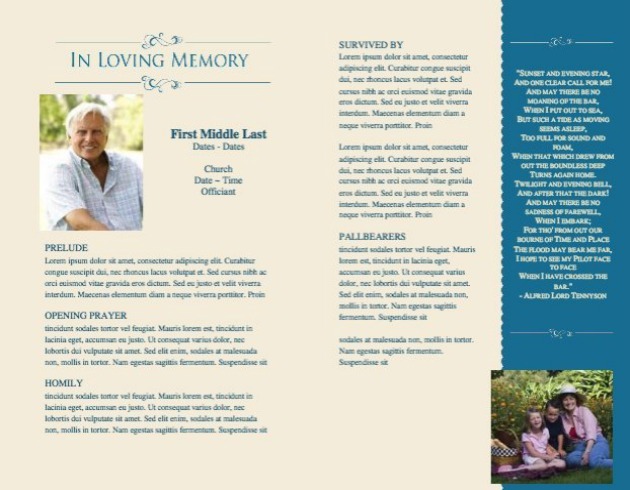 You can create a one-of-a-kind funeral program that will always be treasured. 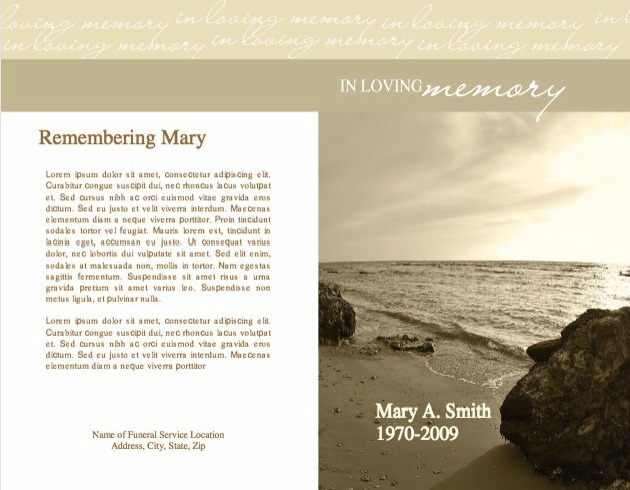 Our artists have designed background templates that are unlike the generic, typical program. 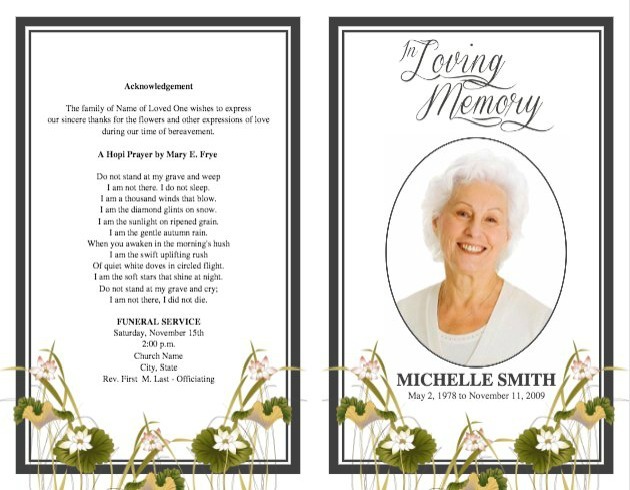 These are funeral programs that will be kept always, as a keepsake of this day. 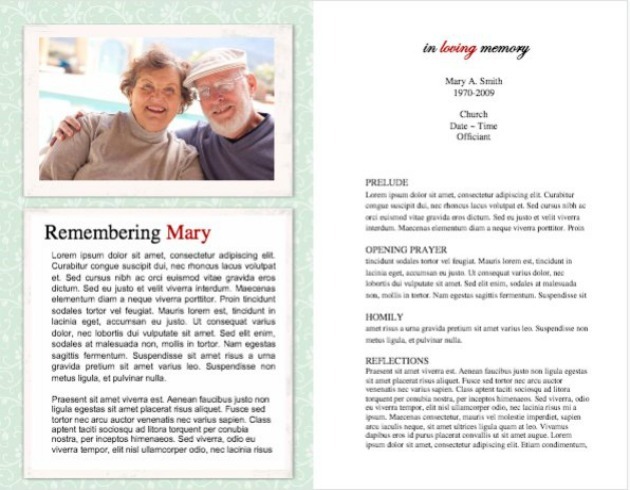 Don't settle for the ordinary funeral program template. You can quickly and easily create an original masterpiece - made for this day alone. And unlike any other. People tell us creating their own funeral program gives them tremendous comfort while preparing for the service. Going through old photos, sharing memories, favorite things. Choosing a song. Possibly a psalm. Searching for the perfect poem. 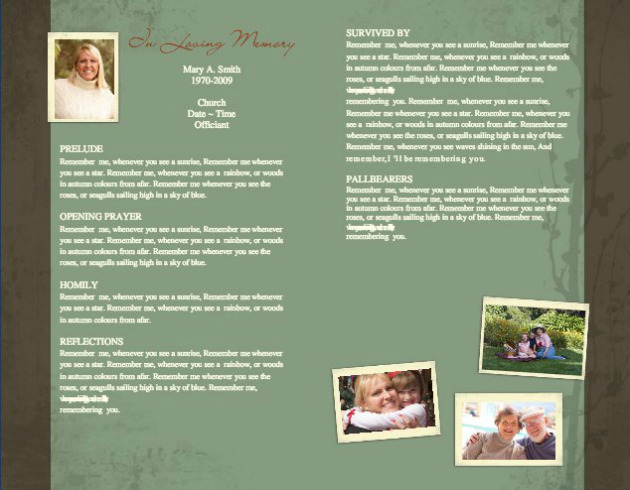 It's deceptively simple to create your memorial program. 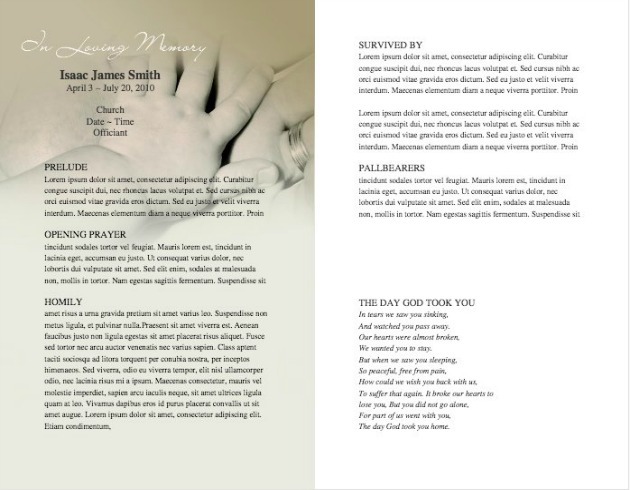 It does require a bit of effort on your part, but we've made it easy with our simple step by step directions for our funeral program templates. Unique templates that are unlike any others. 1.Choose your template and then download it. 2. 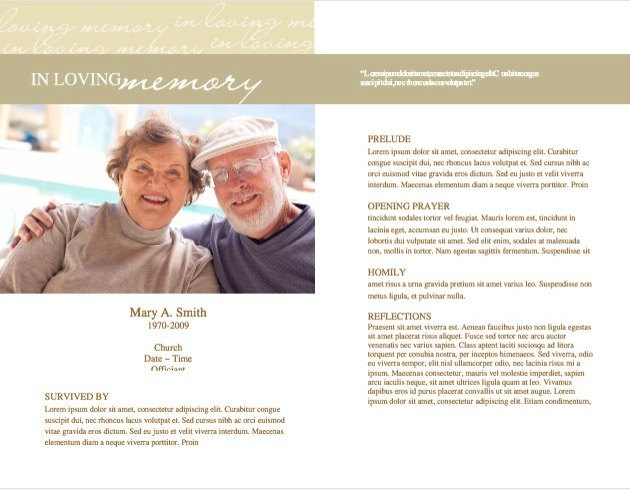 Then insert your own photos, and edit the text for the program. 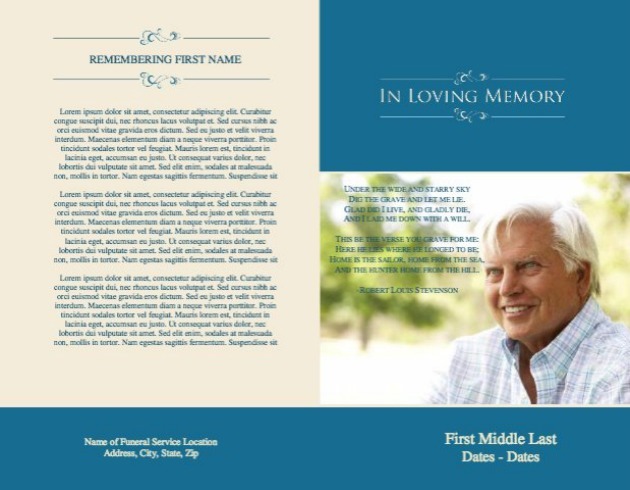 These templates are all ready for your personal stamp. 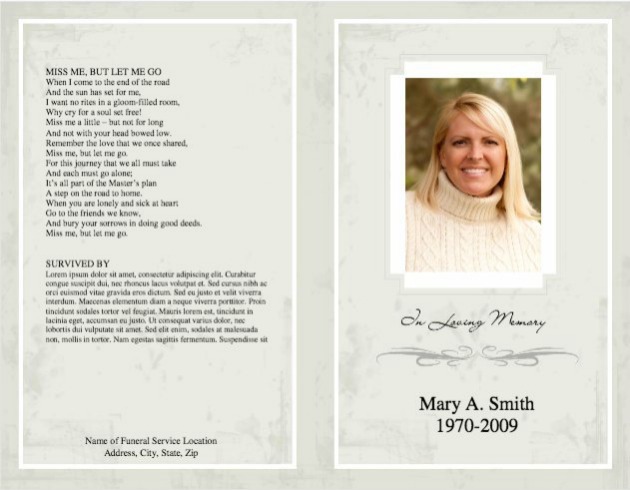 an if you want to really make it beyond compare, we can write a custom written poem, created specifically for you about your loved one that you can include in the program. 3. Then print it at home or send it to a copy shop. 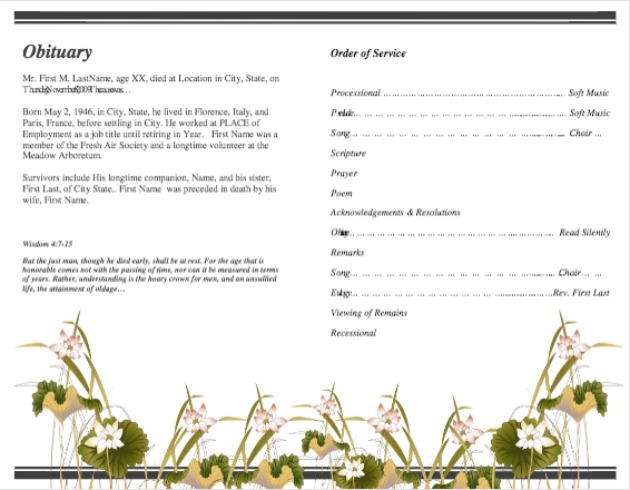 Your word.doc templates are sent to you in a downloadable zip file. You simply open it up in Microsoft Word and change the wording and photos to your own. Then, simply print and you are ready for the service. To help you get started, we have a free pdf file with suggestions on various Things To Include In A Funeral Program. "What a great service you offer. The program is coming out just the way we wanted it to!" 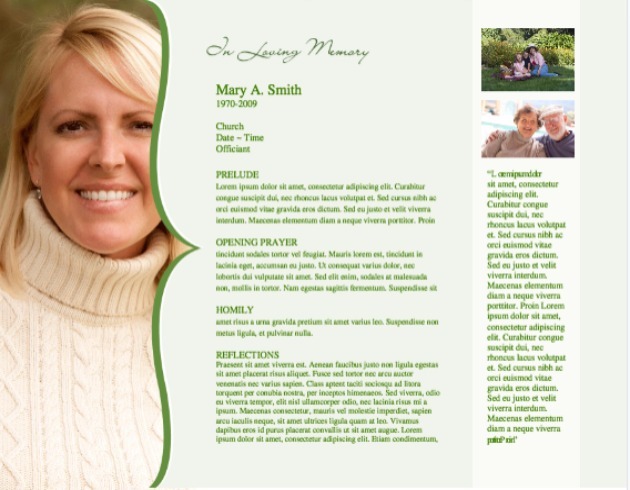 All templates are single fold and print on 8.5 x 11" paper. You can spend a lot of money for a program, or for only $19.95 you can create your own masterpiece. Such is the beautiful power of an enduring soul and a life honestly lived. The question really is, how will we survive without her? You cannot hear the waterfall if you stand next to it. 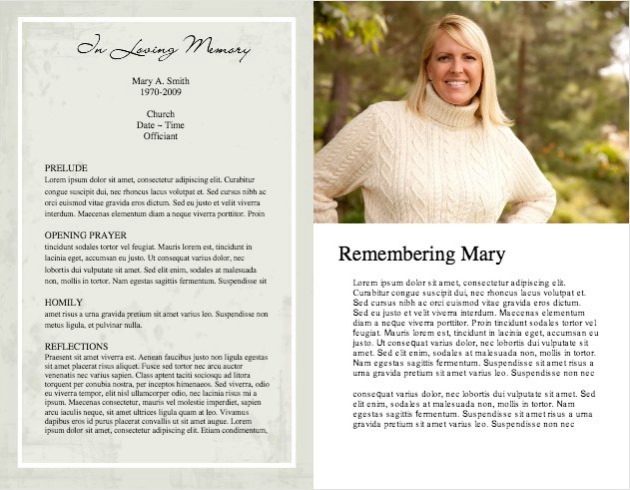 Her Spirit will live on in her children and her children's children. When you can no more hold me by the hand. A simple - but elegant template on a white background. 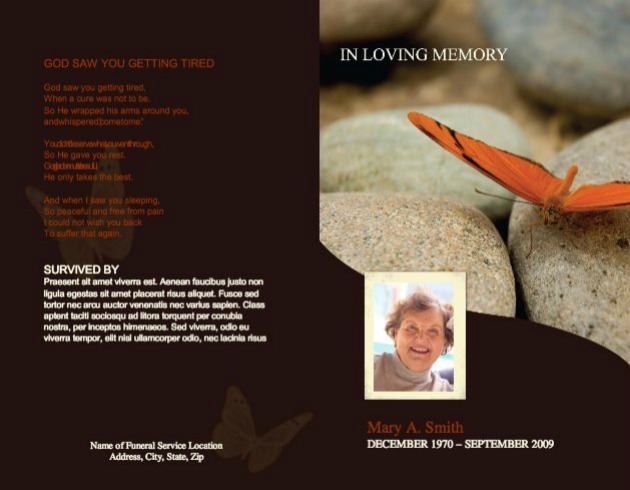 We also can write a one-of-a kind poem especially commemorating your loved one. 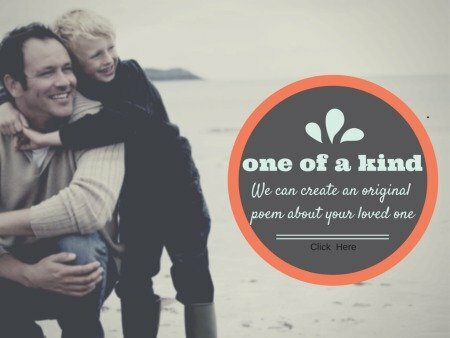 Learn more about our unique poem writing offer. Thank you Susan - I bought the Elegant one and it has turned out beautiful. Thanks for providing such an easy to use format." Hi, Susan here. I just wanted to tell you about my 100% money back guarantee that protects your purchase. Try this product and if it doesn't fulfill what I've promised, I'll refund you in full. No hassles. Also, be aware that this page is 100% secure, which means that your credit card details are safe. All you need to do now is to select your template and you will be taken to a secure order page. I look forward to serving you. Question: Does this work with both the old and new versions of Microsoft Word? Answer: Yes, the template works with both versions. 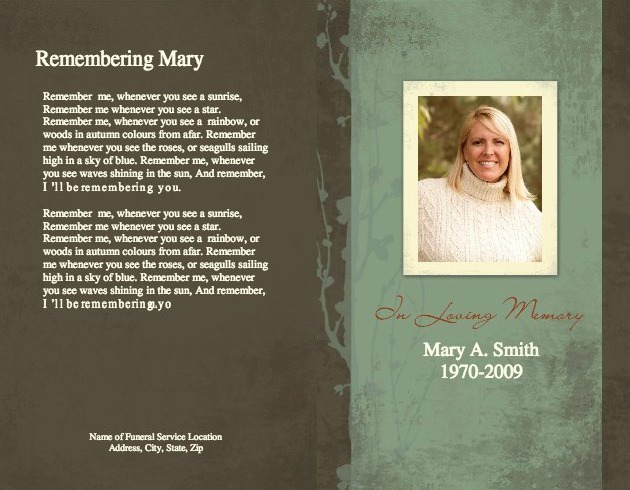 Answer: You can use regular white 8.5 x 11 paper, as the color is printed onto the paper via the printer. It is recommended to use a heavier paper, for better quality and appearance. It really gives it the WOW factor. Answer: Hi Danny. Inserting a picture is simple. As per instructions: Go to Insert tab, Go to Picture, from File. Double click. Now Right click on the picture. 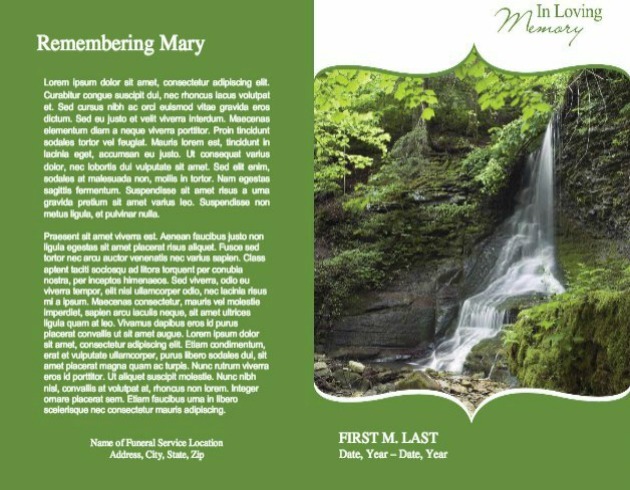 Go to Format picture, go to Layout tab and click In Front of Text. That should work. Let me know. 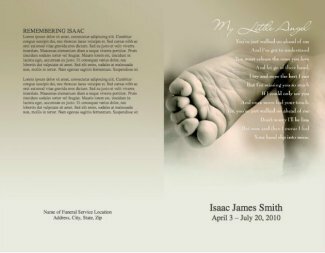 If you are interested in giving the funeral or memorial service, we also offer a downloadable eBook of Sample Funeral Services Your Word By Word Guide to help you create a memorable and personalized service for your loved one. 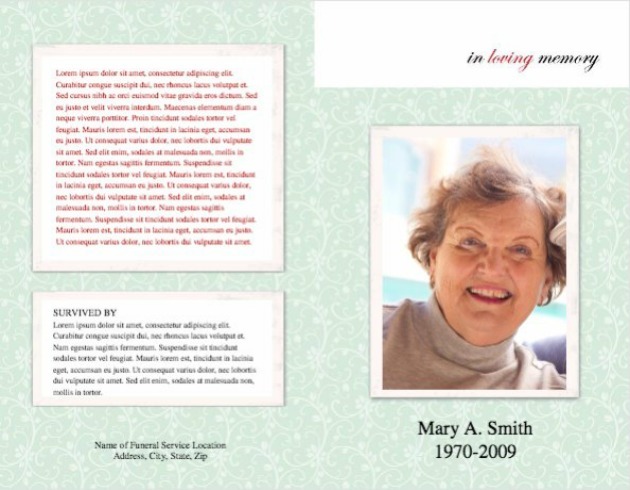 The book includes four funeral and memorial service programs to choose from, plus a selection of prayers, Bible Readings, Remembrance Poems, Funeral Readings and Quotations.